Kiyota Kiyokazu (Kiyo), Tachibana Shigeo (Shige) and Arimura Norio (Nori) are childhood friends. Upon reaching the retirement age, Kiyo had to retire from his job, only to take up contract work at a Game Center. Shige owns an izakaya (Japanese pub) and used to run it until recently, having handed over the reins to his son, Kosei. Nori is a manager of a machinery equipment manufacturing plant. Back in high school, the three of them were part of the "Three Bad Boys" group. Kiyo is an expert in Kendo, while Shige has a black belt in Judo, and Nori is an ex-military strategist. All in their 60's now, the 3 of them get together to form a vigilance committee, and patrol the neighborhood at night. Sanbiki no Ossan 2 ~ Seigi no Mikata, Futatabi! 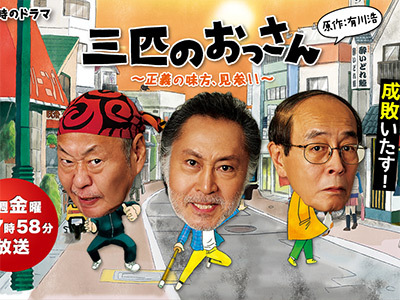 2015 Sanbiki no Ossan 3 ~ Seigi no Mikata, Mitabi! It was okay. 3 retirees patrol their neighborhood preventing crime. My favorite episode was episode 6 where they needed some help and couldn't do it all themselves.